Posted by Noah Poser on January 25, 2019 in Sports, Top Dawg, Top Stories. It was a relatively quiet week for Ferris athletics, with just two home doubleheaders for men’s and women’s basketball. That made it really tough to choose who gets the prestigious Top Dawg award for this week as there were multiple standouts in each game. 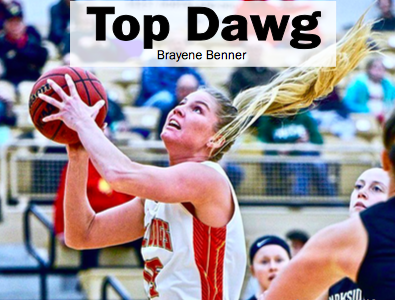 However, an athlete must be chosen, so with no disrespect to the other athletes, Ferris junior starting center Brayeve Benner has been honored as Top Dawg this week. In a game this past Thursday against Purdue Northwest, the Ferris women’s basketball team dominated throughout the game and won in commanding fashion by a score of 94-78. Benner had a spectacular performance in this game to lead the Bulldogs. She dominated the Pride on both ends of the court. On the offensive side, Benner finished the game with 18 points and 10 rebounds, six of which came on the offensive glass. On the defensive side, Benner accumulated four steals and eight blocks. In 15 games this season, Benner is averaging 8.4 points per game on 59.8 percent shooting and 6.3 rebounds per game. This is to go along with 2.2 blocks per game and 1.1 steals per game. Her 2.2 blocks per game leads the team. Benner really stepped up her game in this one, and it led to a much-needed conference win for the Bulldogs. It’s fair to say that the team will be hoping for more of these performances out of Benner as it will help in the Bulldogs ght for a conference championship.